The Woma python (Aspidites ramsayi). 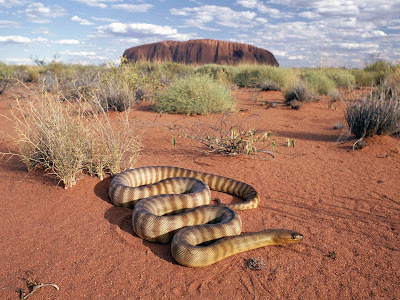 Image from http://www.free-desktop-backgrounds.net/Animal-reptiles-wallpapers/Snake-wallpapers/Woma-python-snike--Aspidites-ramsayi-.html. Following on from the Stimson’s python I featured in my last post, I thought I’d make pythons the subject of my first lengthy scientific post. Pythons are well-known and much-admired snakes (at least amongst those of us not afflicted with an overwhelming fear of snakes). They are medium-sized to gigantic, non-venomous constrictors that lay eggs in contrast to the similar boas, which give birth to active young. Unlike boas, which have their stronghold in the new world, it is Australia and New Guinea that forms the global hotspot of python diversity. Of the nine recognised genera of python, seven occur in Australo-Papua. 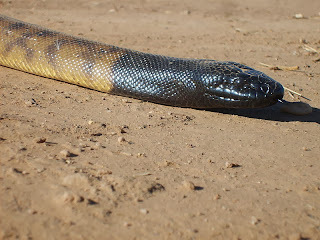 We also have some of the most disparate pythons in terms of anatomy including the distinctive terrestrial Aspidites species, the relatively tiny Anthill python, Antaresia perthensis and the green-tree pythons (Morelia viridis and M. azureus) which show remarkable convergence with the emerald tree boa (Corallus caninus) of the neotropics. So an obvious question is why are the pythons in Australo-Papua so diverse? One hypothesis immediately suggests itself: pythons originated in Australia, presumably descended from primitive snakes that inhabited Gondwana and were isolated on Australia when it broke away from Antarctica in the Early Cenozoic (about 45 million years ago). They would have then undergone their initial radiation here, and once Australia had drifted far enough northwards spawned a relatively recent lineage (the genus Python) that dispersed to Asia and Africa by Island hopping through the archipelagos of south-east Asia. We can label this the ‘Out of Australia’ hypothesis. There is something intuitively appealing about the idea that pythons were dispersing in the opposite direction while Australia was getting the founders of much of the rest of its lizard and snake fauna (front-fanged snakes, skinks, dragons and monitor lizards) from Asia. The ‘Out of Australia’ hypothesis makes a couple of clear, testable predictions. Firstly the fossil record of pythons in Australia should extend back to a time before Australia had drifted into range of terrestrial animals dispersing from Asia. That date would appear to be somewhere close to the Oligo-Miocene boundary (about 23 million years ago) for that is when skinks and dragon lizards make their first appearance in our fossil record. Secondly the pattern of evolutionary relationships within the python family tree should show a basal radiation of Australian lineages with the non-Australian pythons arising from within that radiation. 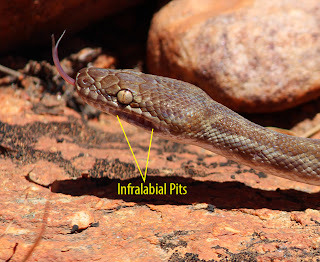 Prior to the 1990’s the fossil record of snakes earlier than the Pleistocene in Australia was far too scant to determine whether or not the first prediction had been met. So it fell to the study of the evolutionary relationships of living python species to test the second prediction. The first numerical cladistic analysis of python relationships was published by Kluge in 1993. He used morphology and found a result that strongly supported the ‘Out of Australia’ hypothesis. In broad terms he found that the Australian genus Aspidites branched off first, followed by a large paraphyletic array of Australo-Papuan species that have at some time in the past been placed in the genus Liasis, followed by a clade consisting of the Australo-Papuan genus Morelia and the African Australian genus Python. Cladogram from Kluge (1993) with illustrations and simplified generic classification added. Specifically the genera Antaresia, Leiopython, Liasis, Bothrochilus and Apodora have been collapsed into the paraphyletic 'Liasis group'. 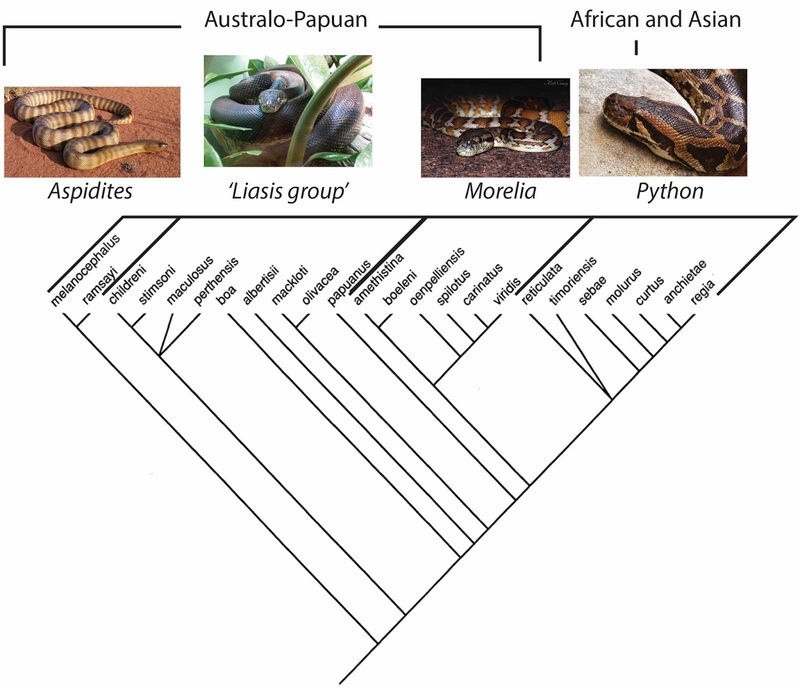 Biogeography added above makes it clear that in this analysis the non-Australian genus python had its origin within an Australo-Papuan radiation. One of the robust and central findings of this analysis was Aspidites as the sister taxon to all other pythons. Aspidites includes two species: the black-headed python (A. melanocephalus) and the woma (A. ramsayi, see picture at the top) and these are definitely the oddball pair of the python family. They lack a host of features found in other pythons that Kluge interpreted as primitive characters that indicate they lie outside all other pythons. These include a lack of teeth on the premaxilla bone (at the front of the snout), absence of a constricted neck behind the head and a lack of heat-sensing pits along the lower lip. Heat sensing pits along the lower lip of a Stimson's Python (Antaresia stimsoni). These are technically called infralabial pits. Image by Adam Yates. Head of the aptly named Black-Headed Python (Aspidites melanocephalus). Note the lack of infrabial pits (although a single rostral pit under the tip of the snout has recently been demonstrated. Photo by John Tann from http://commons.wikimedia.org/wiki/File:Aspidites_melanocephalus_Head.jpg. But are these odd features of Aspidites genuinely primitive or do they represent secondary specialisations to a terrestrial burrow-inhabiting lifestyle? We’ll see what molecular data has to say in part 2. Kluge, A. 1993. 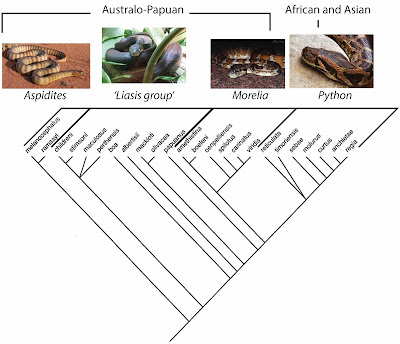 Aspidites and the Phylogeny of Pythonine Snakes. Records of the Australian Museum. Supplement 19: 1-77. This Blog replaces Dracovenator, my old blog from when I lived in South Africa. I've moved now, to the centre of Australia and finally have a home internet connection and a renewed sense of wonder and vigour about the natural world and its aeons of history. Since I'm in a completely new situation I need a new blog. It's still going to be a an uber-nerd's blog filled with natural science, especially palaeontology, though perhaps not quite so many dinosaurs.